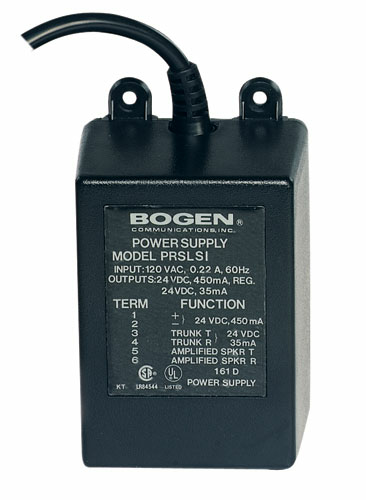 The Bogen PRSLSI functions as both a loop start interface for small paging systems and as a 24V DC power supply. The PRSLSI includes Tip and Ring terminals for connection to a loop start trunk to provide paging access and enough audio capacity to drive up to 25 self-amplified speaker inputs. It also supplies 9 CU (450 mA) of regulated 24V DC power for external equipment like self-amplified speakers.